I'm just wondering if anyone else has had this experience before. You're out skiing, just cruising along and out of nowhere something white and fast is running out right in front of you. Startled and trying to dodge this furry creature, you end up in a massive yard sale. This happened to me one day while skiing at my home mountain in Wyoming. I look back up the hill and a Snowshoe Hare is sitting safely on the side of the run laughing. Hmmm much like that Geico commercial. I've had squirrels, chipmunks, and rabbits do this before in my ski life but not as often since I've been at Powderhorn. Then one day the weirdest little animal I had ever seen ran across my path on the West End. Turns out it was an ermine. I had never even heard of them before. They are small short-tailed weasels, long cute little things. Their coat is brown in the summer and then turns all white for the winter except the tip of their tail which stays brown. Ermines are nocturnal animals but can be spotted around Powderhorn every once in awhile so keep an eye out for them. Sometimes you can spot them from the lift running between the aspens. 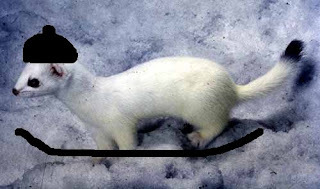 Maybe our mascot should be the Ernie the Ermine? Some dozen or so years ago, my brother and I had a really good wildlife encounter at Powderhorn- first thing in the morning, we headed up the Quad and turned right to go to the West End lift. On the cat trail to Maverick, we jumped a pair of coyotes. They started running down the cat trail and on down the run, with us in hot pursuit right on their heels. One of them veered off and started up Looky- Looky, but circled back and rejoined his partner and they both decided to try a different tactic and headed off of the run and into the trees, thus escaping us. I think they were very surprised to have humans "run" as fast as they did. Ernie the Ermine...I like it, and he's cute too! That coyote story is great!